ArthryDex™ es un suplemento nutricional completo con vitaminas, aminoácidos y enzimas formuladas para apoyar la salud de los huesos y las articulaciones en animales pequeños y grandes. 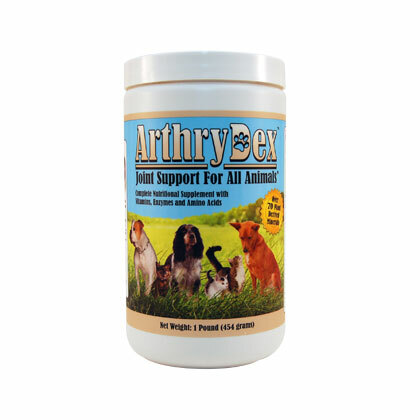 ArthryDex is a complete nutritional supplement with vitamins, amino acids and enzymes formulated to support healthy bones and joints in small and large animals. * For birds, rodents and reptiles: use 1/4 teaspoon and sprinkle on food. * For dogs, cats and other animals up to 12 lbs: use 1/2 teaspoon. * Pets of 13 pounds to 24 lbs: use 3/4 teaspoon. 1 tablespoon per 25 pounds of body weight. Loos for larger animals such as horses or llamas: Use 1/2 cup per feeding up to 3-4 cups a week. CAUTION: Only animal, not recommended for human consumption!